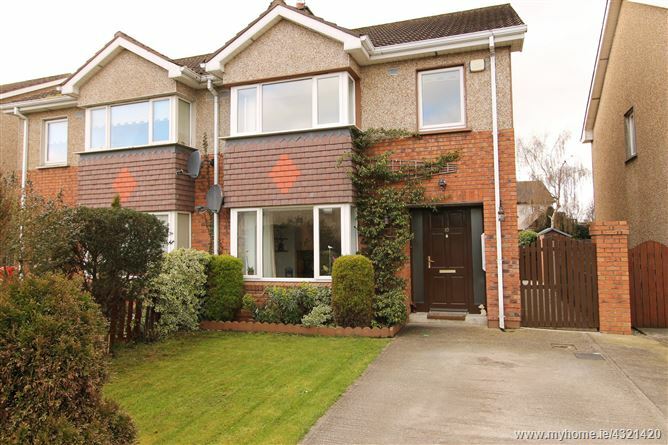 A well presented and maintained three bedroom semi-detached home in a quiet, modern, sought after development of just 20 houses, situated within walking distance of Nenagh town centre, schools and Churches. The accommodation comprises of entrance hallway with tiled flooring and a carpet stairs leading to the first floor. To the left is the spacious sitting room with a laminate floor, bay window and open fire place. The kitchen/dining room to the rear has sliding doors to the well maintained rear garden. The kitchen is fully fitted and there is a mixture of tiles and laminate flooring and is plumbed for a washing machine. The first floor comprises three bedrooms, two of which have built in wardrobes and the main bedroom has an en-suite shower room. The family bathroom is partially tiled with W.C., W.H.B. & bath. Outside to the front is a parking area and a mature garden. The secure and private rear garden is accessed through a side gate and has been beautifully landscaped with raised beds and a mixture of paving, lawn and chips. This house represents an ideal family home or investment property and viewing is strongly recommended. Entrance hallway, sitting room, kitchen / dining room, 3 bedrooms (1 en-suite) & bathroom. Tiled floor, storage cupboard and stairs to the first floor. Laminate timber floor, bay window and open fire. Laminate and tiled flooring, fitted kitchen with electric oven and hob and plumbed for a washing machine. Laminate timber floor and built in wardrobe. Tiled floor with W.C., W.H.B. and electric shower.